Cranberry | Gurney's Seed & Nursery Co.
Tart Berries for Holiday Sauces! Vining ground cover bears tart, edible berries. Grows just 10 in. tall and 2-3 ft. wide. No pruning needed. Thrives in sun or shade, acidic soils. Cream-to-pink springtime blooms and burgundy-red fruit in fall. Potted. Zones2 - 7 (-50° F.). Soil RequirementsAcidic well-drained moist soil with organic matter. CommentsVining ground cover bears tart, edible berries. Grows just 10 inches tall and 2-3 feet wide. These attractive ornamentals require no pruning. 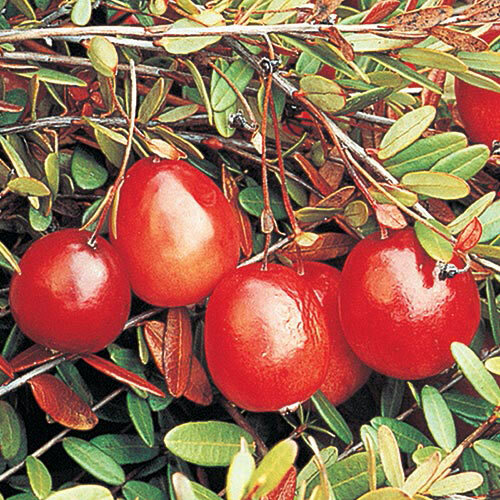 Cold-climate natives, cranberries thrive in sun or shade and require acidic soil and adequate watering. Produces cream -to-pink springtime blooms and burgundy-red fruit in fall. Potted. Zones 2-7. Not available in CA, GA, MI, OR, WA. DepthPlant at the same depth as it is in the pot.